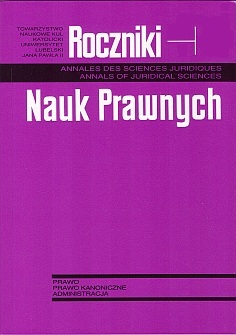 Roczniki Nauk Prawnych (Annales des Sciences Juridiques, Annals of Juridical Sciences: Law, Canon Law, Administration) - a periodical published by the Learned Society of the John Paul II Catholic University of Lublin and the Faculty of Law, Canon Law and Administration. It was separated from the Annals of Theology and Canon Law and has been published since 1991. It offers scholarly articles on law, canon law and administration. The original version of the journal is the paper version. The journal has been accepted by ERIH PLUS (The European Reference Index for the Humanities and the Social Sciences). "Roczniki Nauk Prawnych" journal was positively evaluated by IC Journals Master List 2013 and given 4.49 ICV points (Index Copernicus Value).